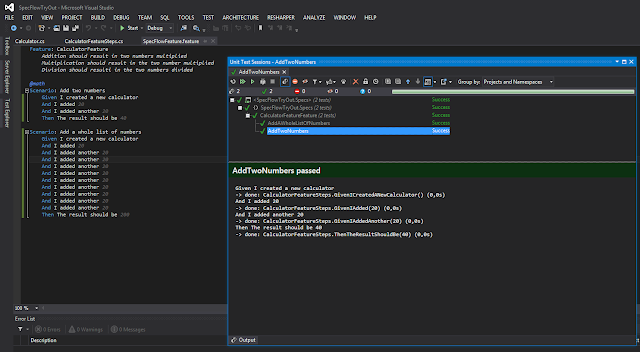 Trying out a BDD framework in Visual Studio had been on my list of weekend projects for quite some time. I know of two frameworks for .NET: NSpec and SpecFlow. I was most interested in the latter, since that allows the specs to be written in plain text ( see cucumber ). This, I think, could be useful to verify the tests against the business or the analysts, involved in the development of the application. Getting started with SpecFlow is really easy - check out: http://www.specflow.org/getting-started/. No I'll think where and how to apply this in my projects.